RUSH: This is J.R. Columbus, Ohio. Great that you waited. I appreciate your patience. Hi. CALLER: Mega Thanksgiving dittos, Rush. CALLER: Absolutely. Okay. So do you think it’s strange that Barack and Michelle Obama have been very quiet since the Harvey Weinstein thing blew up? RUSH: No. Because I would not expect them to join the chorus of condemnation. RUSH: They might utter a statement or something, a sentence, but they’re not gonna dwell on this. No. Does it surprise you? What would you expect them to say? CALLER: It surprises — well, maybe it doesn’t surprise me. These are the people they hang out with. Isn’t that correct? RUSH: Oh, exactly. They hang around ’em, they take their money, they join them at other fundraisers, they pat each other’s back on joint charities, absolutely, they were inseparable political buddies. Right. CALLER: Got it. Yep. Well, with friends like that, who needs enemies, right? RUSH: Well, you know, that’s the thing about this. These are questions I don’t know. Let me just share with you, when I see Harvey palling around with Bill and Hillary Clinton and knowing the Clintons as I do, I wonder if what evolves there is a genuine friendship or a politically expedient photo-op kind of relationship. No question the Clintons thrive on the money that Weinstein brings. But is it the money that opens the Clintons’ doors for the Weinsteins, or is it that the Clintons really like the guy and would be in their circle of friends if there wasn’t any money? And that’s where I think no. I think in too many worlds of politics money is the fundamental ingredient in relationships. I think that’s one of the many things wrong with it. And this is has been an eye-opening thing for me too. Folks, I have been so naive about many things, like most of us are, for most of my life. For example, when I’m younger and I’m reading any publication, a newspaper, magazine, and I see a profile of a person, not necessarily a Hollywood star, just a person, somebody noteworthy for doing something. In the old days I used to think that that profile was there because whoever was being profiled had genuinely earned it by being singularly unique or having a distinct achievement that warranted such attention in the media. Later on, much later on I learned that that’s got nothing to do with who gets profiled. It has to do with PR agents pitching these stories to reporters and editors. And it comes about, in most cases, largely for reasons unrelated to the substance. And it is in these circumstances that you learn how media relationships are created. And it’s not based on the same things that you would think friendships are based on, genuine and real, when you really like somebody, not that they’re gonna raise a bunch of money for you or give you a bunch of money. When you really like somebody, not because they’re going to arrange a big magazine story on you, but you genuinely like them. And I think in the world of politics, money is the element that puts people together. Now, I’ve always known that to be the case, but now I ask myself, if it weren’t for the fact that Weinstein’s out raising a bunch of money and giving it to the Clintons, would they spend any time with him at all? I don’t know the answer to that, but if the answer is “no,” then what does it say about the relationship to begin with? That it’s kind of fragile and it’s based on things that have nothing to do with genuine, real friendships and relationships. I mean, how do the Obamas know Weinstein? I mean, the Clintons were first with Weinstein, going way back to the nineties. Here comes Obama. 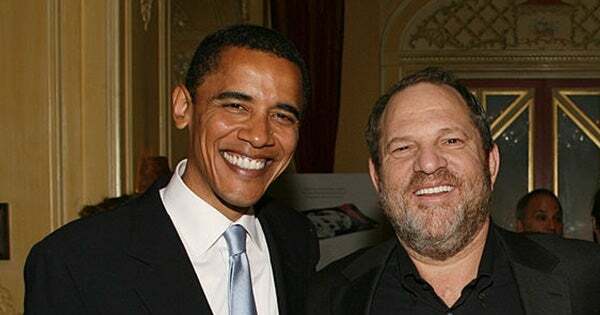 Obama knows Weinstein ’cause they’re both Democrats. Weinstein likes to hang around with powerful people, so much so that he will raise and spend money to do it. And let me give you a little hint: That’s how you have to do it. If you want to hang around with a president, raise a lot of money. If you want to be invited to presidential forums, raise a lot of money for ’em, or donate, I guarantee you you’ll be invited. Whether the president knows you or not. And then you’ll be able to go through the motions of being a friend with the president, be able to talk to your friends, “Yeah, the president and I were talking the other day.” What made it possible was you giving the money, not the fact the president knows who you are and really likes you. That could end up happening. So, as far as the Obamas are concerned I think it’s quite natural they’d look at this thing and think Harvey’s probably worth throwing overboard here. Harvey doesn’t mean enough to them to try to save him. That’s up to Harvey. If Harvey can save himself, if Harvey can rehab himself, if Harvey can get back to where he was and start resuming funneling money, then the Obamas will welcome him back. It’s another reason why I could never do politics. I couldn’t ask for donations, and then I wouldn’t want to be obligated after I got any. I just couldn’t do it. Different world. But money is what creates many political relationships. Donating it, arranging for it, bundling it. And once you’re out of that business, your contact with the politician in question diminishes. Their time is very limited. And most politicians, from presidents to senators to members of the House, you wouldn’t believe how much of their spare time is spent raising money for the next election. In the Senate, that’s practically all they do. And if you don’t have a connection to ’em with money, the odds are you’re not gonna be in the inner circle or anywhere near ’em.